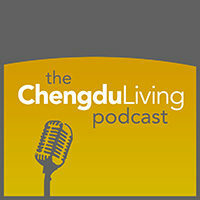 In this episode of the podcast I have a conversation with Phil, one half of the Chengdu-based Chinese language program called Mandarin Blueprint. Our conversation covers many areas of language acquisition, in both formal and informal settings, and includes a ton of useful tips for Chinese learners in particular. Phil speaks tremendous Chinese and has, with his business partner Luke, created a comprehensive program for guiding students online and in Chengdu toward mastery in Chinese. 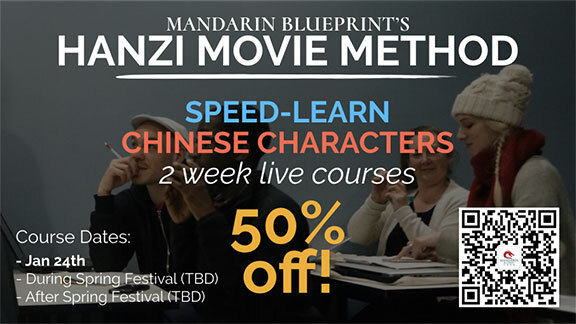 For a limited time, Mandarin Blueprint is offering a deep discount on their “Hanzi Movie Method” program. Scan the QR code in the image below to learn more or sign up for the two week course at the limited-time 50% discount rate. Great podcast. First comment attempt: “comment too long” lol. So I’ll divide it into two or more parts. I think you both have a deep understanding of the Chinese language, probably even better than an average Chinese person. 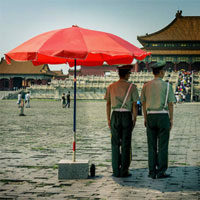 As a Chinese myself I don’t even know much about my first language in terms of structures, tones and syllables. 409 syllables in Chinese? I didn’t know that. Ha. Right? One of my only regrets is that I didn’t ask Phil to actually speak some Chinese. He is really skilled. Hearing a foreigner speak such good Chinese is a great motivator to improve. “The things that unite people more and not the ‘culture’ that divides people” – I’m a firm believer that if you keep an open heart and an open mind, you would be surprised to find yourself on the track to gain the best of both worlds (East and West). We are all made of flesh and bones and are fundamentally the same after all. Language is a huge part of this. Most foreigners who don’t speak Chinese have difficulty “connecting” on that level. This is why I believe that learning Chinese is maybe the most important foundation of success in China, whether in business, hobbies, relationships, etc. “Immerse yourself in the language you are learning” – can’t agree more as I’ve had a very similar experience learning English. English has been a compulsory subject for me since the fifth grade and all throughout junior and senior high school. Apart from formal learning at school where they focused on vocabulary and grammar rules, I would read books and news articles and listen to podcasts, music and watch a whole bunch of movies in my spare time as well. I could say that I definitely learned way more by self-learning than from my teachers. Didn’t really pay much attention to grammar rules. Sorry, teach. My own experience was that if you have read or heard enough of the language it kind of becomes your second nature when you actually use it- just like learning your first language imo. It’s all about finding your own niche when it comes to language learning. Interest as the best teacher plays a very big part as well. Another thing I want to mention though, is that you won’t be able to truly master the language until you’ve gained a deeper understanding of the culture, as the language is the main medium/carrier of its culture. Any foreigner can learn the native language better through passion and hard work. I feel the same way: it’s inspiring to see how much progress Phil has made. Anyone can do it. But most people will not be able to achieve that level of mastery because it demands a lot of time and effort, discipline, genuine passion for the language, etc. Thanks for the podcast and additional information. Interesting! Did you learn Chinese formally Charlie like Phil did? No, I didn’t, I begun studying Chinese myself as soon as I arrived in China in 2005. I dabbled with some HSK prep classes years ago, but otherwise have never taken any classes. Do you and Phil speak Sichuan dialect as well? Hsk is formal but you can self learn really well.